"You are going camping this weekend and you are excited. But you are also already starting to dread the process of finding the tent, and the sleeping bags, and the cooler and then lugging all that gear into the car. Imagine instead if someone handed you the keys to a fully outfitted camper van." Problem solved! After the pitches the crowd of 150+ audience members selected four finalists to advance to the next round. GoCamp was among those selected; we each had 30 seconds to answer a surprise question. Our question was a softball, "What do you fear most?" These days we're worried about growing too quickly and being overwhelmed by demand for our services. Success is what keeps us up at night. After the second round the crowd voted again, and GoCamp took home the grand prize! 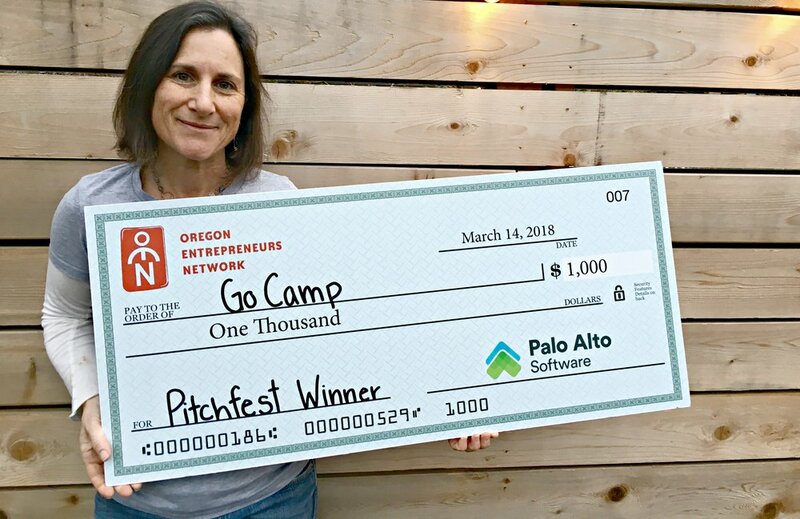 GoCamp wins the Oregon Entrepreneurs Network PitchFest. Thank you to each and every one of you that has rented a GoCamp van. Thank you to the PitchFest sponsors, including Vacasa, Davis Wright Tremaine LLP, Palo Alto Software, PSU Business Accelerator, Underhill Training & Development and to the fantastic audience that voted for GoCamp. And a big shout out to the 21 other companies that participated - we met so many inspirational entrepreneurs in this process.